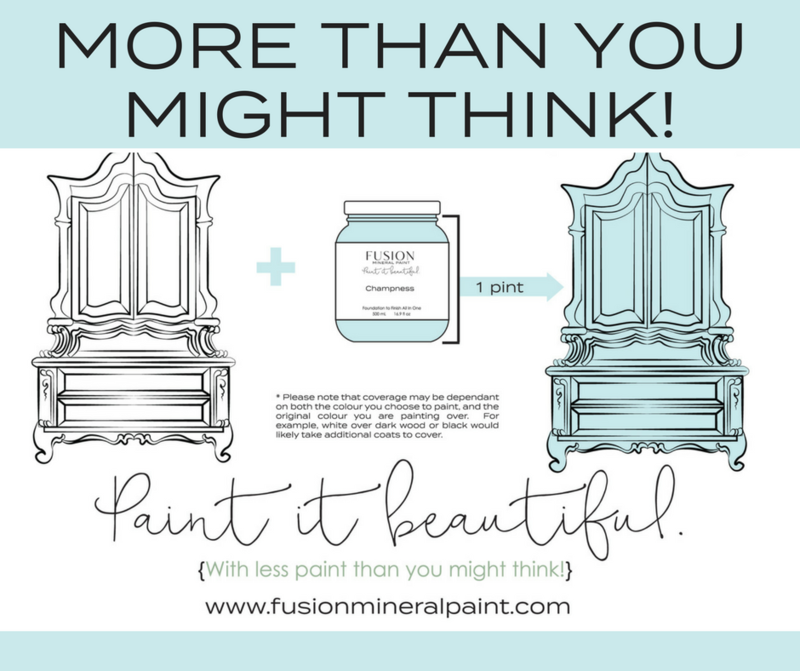 Many are often blown away by the coverage of Fusion Mineral Paint! 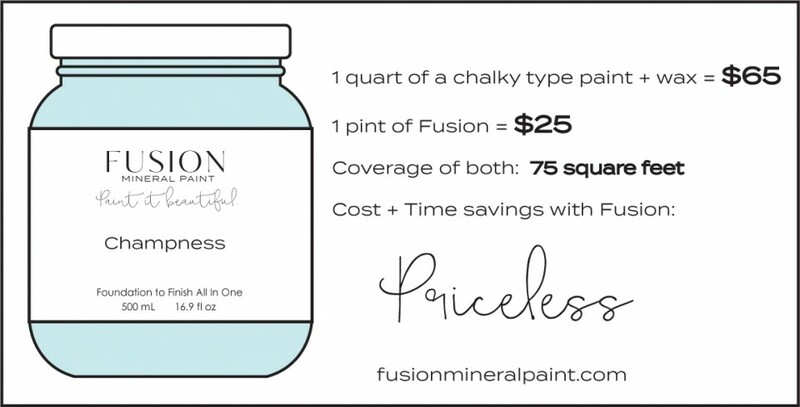 From 1 Pint, you can paint several pieces of furniture, and that’s for under $25! But what does 75 square feet mean? Sometimes it is so hard to visualize! 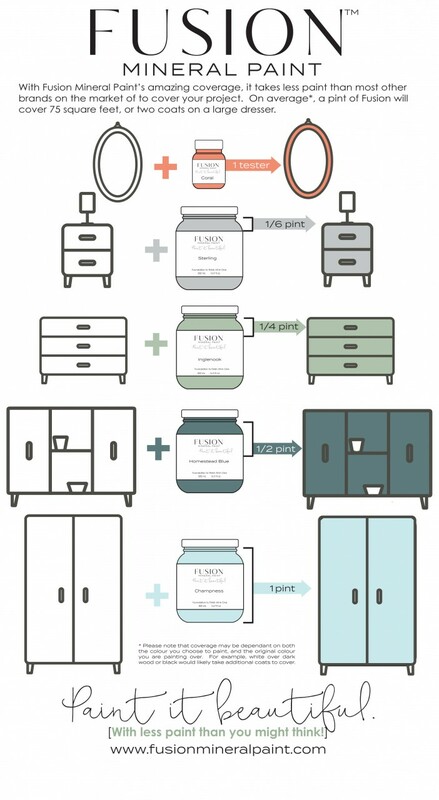 This handy graphic should help you figure out how much you need for the most commonly painted pieces. To ensure the best results, always follow the How to Prep Like a Pro Tips here. 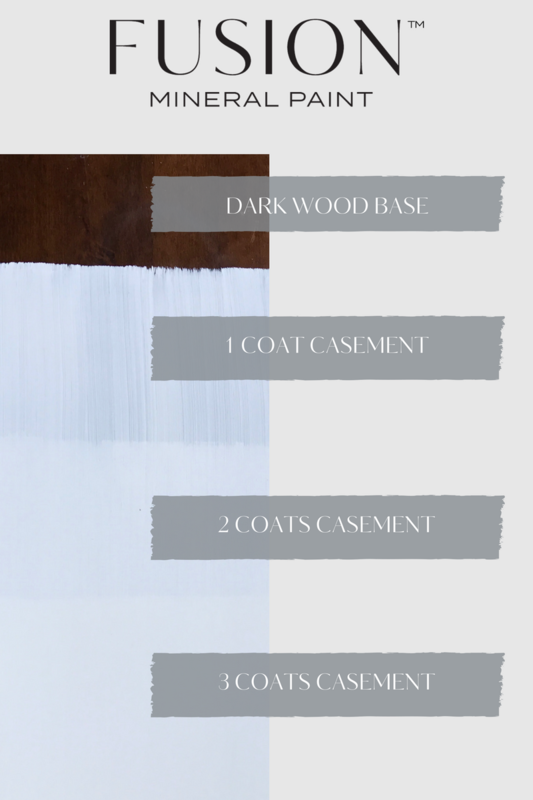 As a general rule, when you are changing the look of your piece and going from a DARK to a LIGHT colour, you will need more coats of paint, therefore you may require a bit more paint than this graph. Especially if you are using colours like Casement or Picket Fence. This is a great example of Champlain over a medium coloured wood. 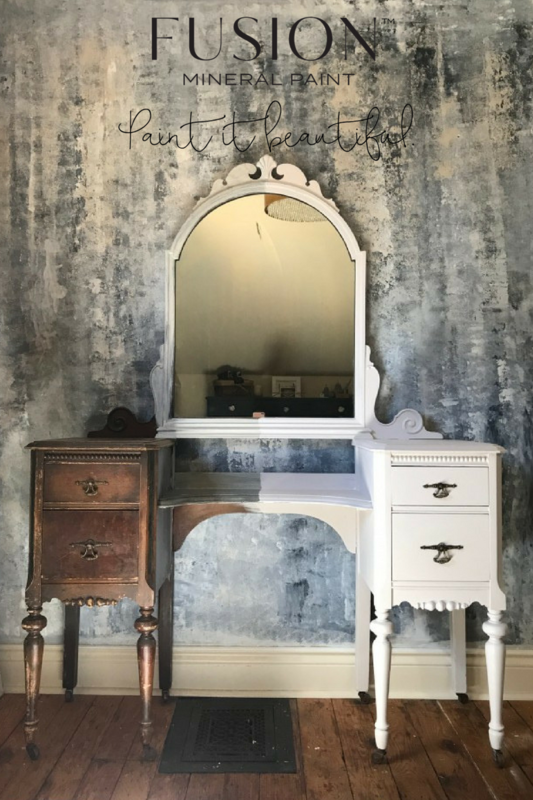 As a general rule, it is always better to lay the paint on thinner and do more coats, it results in a smoother overall finish and less brush strokes from a thick application. Here is what the brightest white, looks like over a dark colour. THIS IS NORMAL! 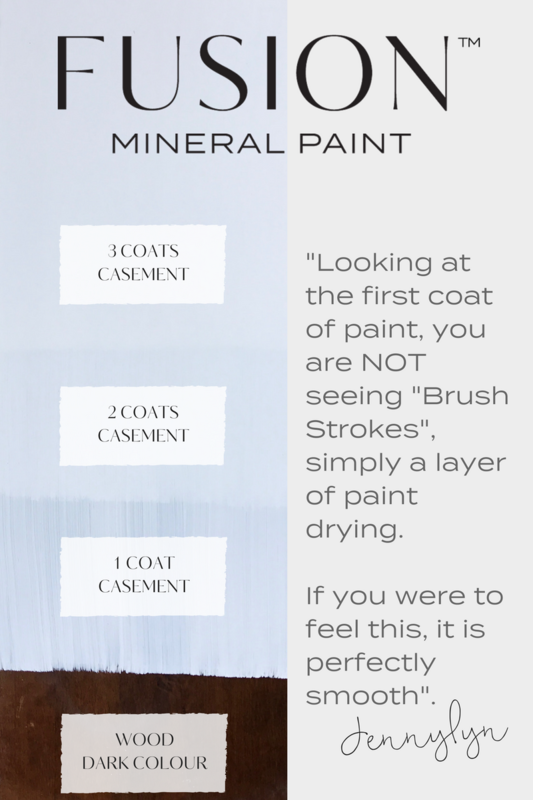 You think are seeing “brush strokes” on your first coat, but what you’re actually seeing is a layer of paint drying and not the texture of brush strokes. If you were to feel this, it is perfectly smooth. See the 2nd coat and what that looks like? Nice even, full coverage, and smooth! 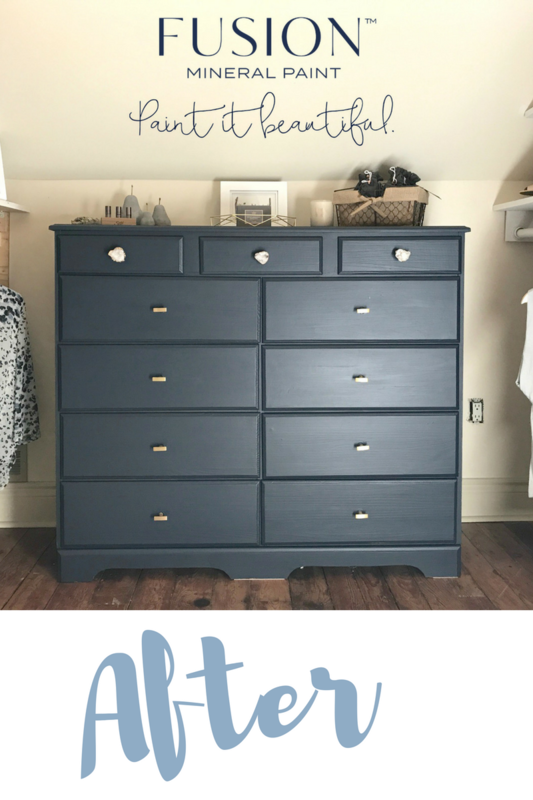 A third coat is even better – but wasn’t entirely necessary! Use a colour like Raw Silk or Sterling first before Picket Fence or Casement for even better coverage! I used one of our Staalmeester Brushes to achieve this flawless smooth finish. 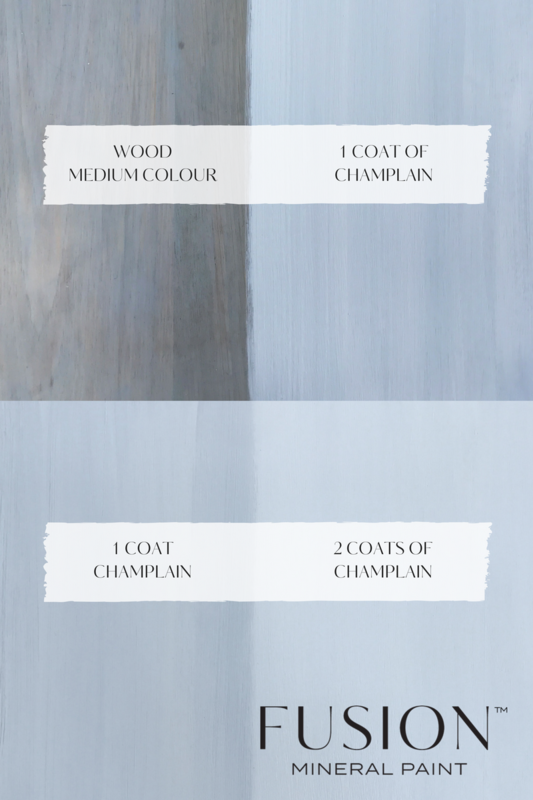 If you are using a mid-tone light colour like Champlain country off white, Little Stork Lavender or even Bedford gray, you’re looking at 2 coats tops. This piece is a half and half painted piece in Little Stork with 1 coat. Darker colours, usually 1 to 2 coats tops! The first coat virtually covers it all, the second coat hits any areas you may have missed. This dresser was a Mustard Colour. I had 1 coat of midnight blue to create this amazing coverage, but in some areas I need a slight touch up second coat. I used only 1/3 of the Pint of Midnight Blue for this entire piece! There are always exceptions! Brighter colours, more pure in tone, without undertones of umber, or oxides, typically require more coats- up to 3 should be the max. So why is this? Most Colours with Umber, White or Oxide pigments, cover VERY well! But they “muddy” down the colour so to speak, it’s quite lovely actually as it is usually a softer antique hue, such as Inglenook, or Buttermilk Cream or Putty. They cover superbly, however they’re not bright in pure tone. Pure tone colours such as Fort York Red, Renfrew Blue. Liberty Blue and Little Star all require minimum 2 coats, usually 3 for full perfect coverage. If we added say more “white” pigment into them, it would make it cover better, but it would make the colour less vibrant and more pastel. To keep the purity of the tone, you can expect a couple of extra coats, but you get a colour unlike any other! Thinking of painting your kitchen? You’re looking at 2 to 4 Pints for an average kitchen. If going with the Casement or Picket Fence, 4 most likely, any other colour, probably only need 2! 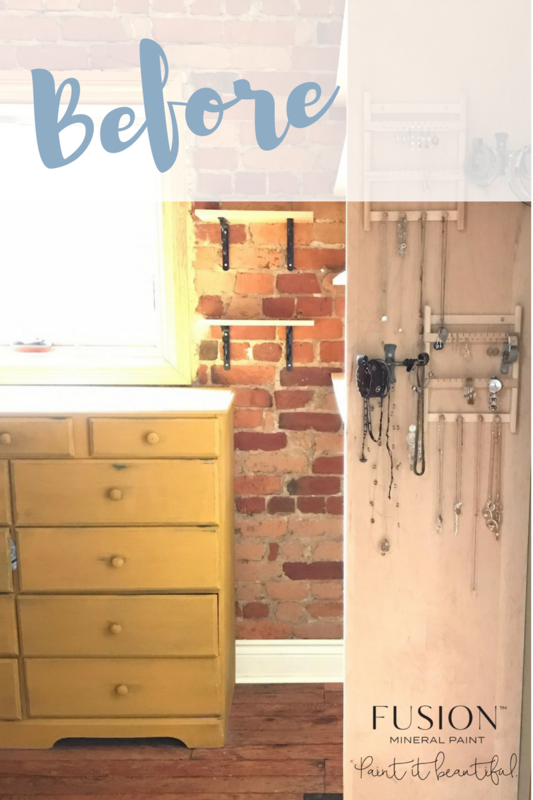 Read more here on how to easily DIY paint your kitchen cabinets! 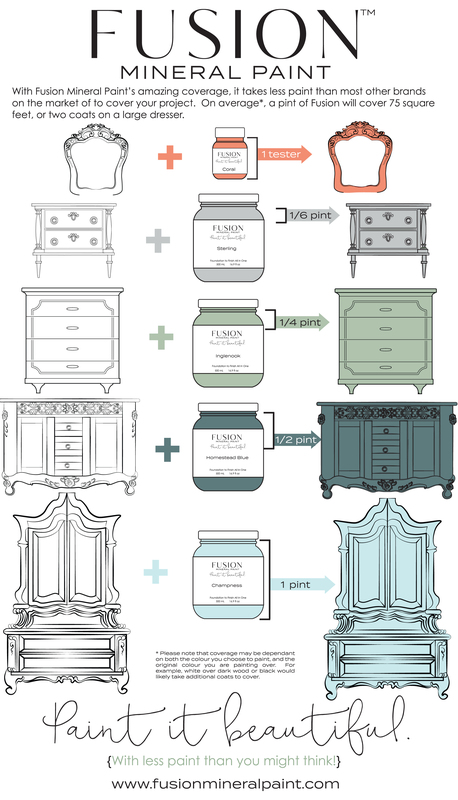 And for good measure, here is the infographic on Fusion Paint Coverage in a modern style.